Cook Healthy Living BBQ Beef Soft Tacos at dinnertime tonight! 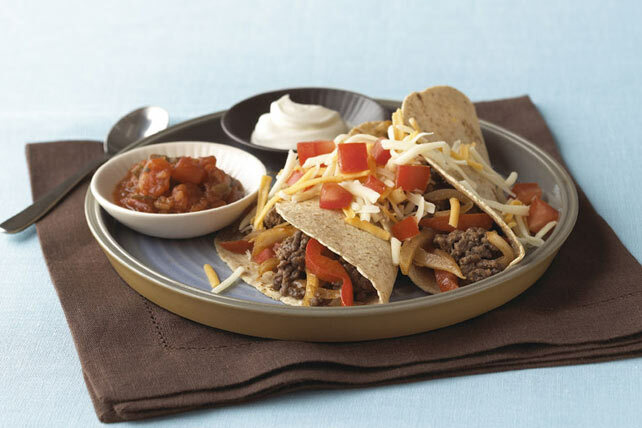 Sautéed BBQ beef, onions and peppers make a flavorful filling for whole wheat tortillas. Brown meat with onions and peppers in nonstick skillet. Stir in barbecue sauce; cook 2 min. or until heated through, stirring occasionally. Serve this tasty dish with bowls of 1/2 cup each TACO BELL® Thick & Chunky Salsa, BREAKSTONE'S or KNUDSEN Sour Cream, and chopped fresh cilantro. Then, everyone can top their tacos the way they like.